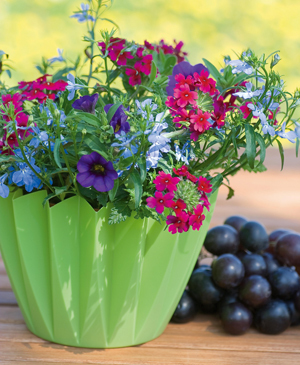 Our Trixi® 'Berry Fields’ Combination weaves its magic with three completely different types of blossoms and colors that meld with and complement one another to perfection. The Lascar™ Compact Burgundy Verbena is the thriller, this brilliant red designed to draw the eye. 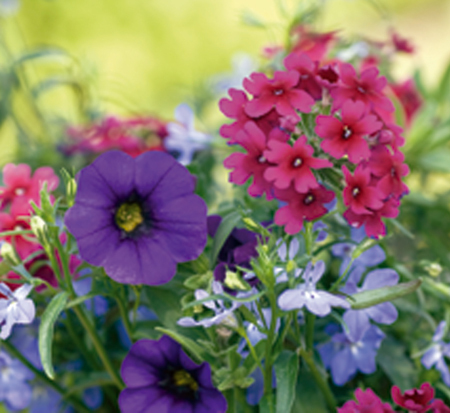 The color of the Royal Blue MiniFamous™ Calibrachoa adds depth, while the Magadi™ Electric Blue Lobelia adds a touch of whimsy, these tiny, lightly colored blossoms looking like wispy butterflies. The plants in our 'Trixi Berry Fields' plants are grown and shipped in fine quality growing medium and are guaranteed to arrive alive and ready to thrive. Comment: I was skeptical at first buying annual flowers through the mail, but I pleasantly surprised. The flower combination is beautiful and the plants arrived in excellent condition and were blooming. This takes the guess work out of making beautiful annual pots. Returned to purchase more.